Like all babies Bear loves to play games. He loves repetition. Although he may amuse himself for short periods of time what he really enjoys most is to play with someone else. We play lots of games together but I wanted to play games that were educational and helped his development; his balance; his coordination; his language skills. I also wanted to play games that he liked too. When I searched the internet for ideas of games to play with a 10 month old, I found they were things we already did! and I tell him everything I'm doing. "Nanny's picking up the kettle"
"oh! Look at the water"
"put your hand in the water, brr that's cold!" I let him smell everything, the coffee in the jar "ah smell the coffee, that's nice" and while we wait we sing, he likes to put his head on my chest whilst I sing, he likes the vibrations. Bear loves the nursery rhymes where something will happen and the expectation makes him laugh, you know the ones; Incy Wincy Spider; This little piggy; round and round the garden (this is great for cleaning hands, we do it after every meal when his hands are covered in food. Have a wet cloth and whilst singing round and round the garden, wipe his hands with the cloth, he giggles before I can go "tiggly under there!" Babies love throwing things and Bear does too but mostly he loves throwing balls. We started with just rolling them to him whilst he was sat on the floor but Bear quickly developed his own favourite game. 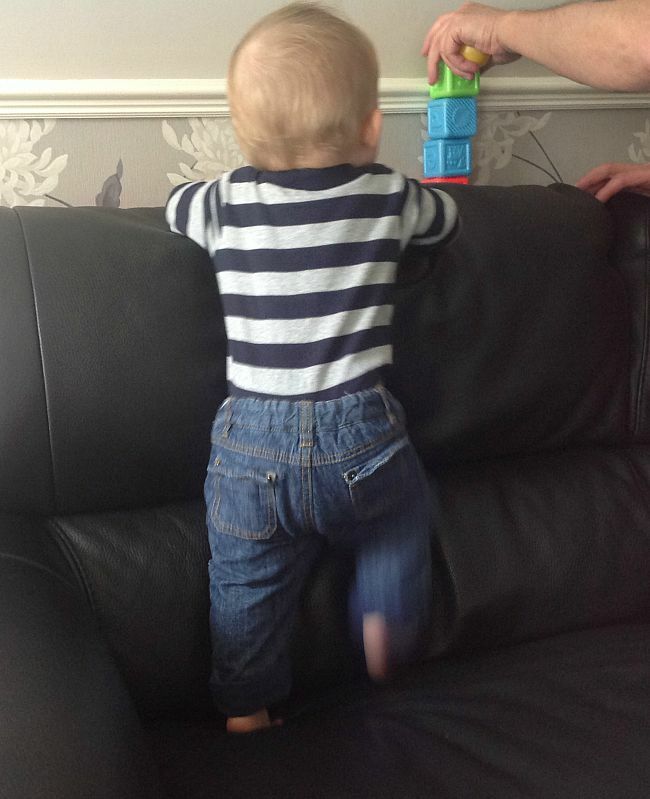 He stands on the sofa and leans on the arm and throws the ball as far as he can for Grandad to go and get it. He waits patiently for the ball to be gently thrown back at him. Be warned, this game has no end, it can go on and on and on! Well that's what I call it! "Peek a Boo" is an alternative name favoured by Americans and people younger than me. It's the game where you hide your face with your hands or a cloth whilst saying "Where's Nanny?" and suddenly appear singing Beepo! Peek a boo! Here I am! There you are! or whatever. We started playing Beepo when Bear was very little, but a few months ago he really started to enjoy it and once he could stand he made up his own version. He would hide behind the end of the sofa, we would ask "Where's Bear?" and suddenly he would stand up with a great big smile on his face and we would all sing "Beepo!" "There he is!". Again and again! Not the big boys game but one of hiding objects. Bear loves to see things hidden in Grandads hands and then reappear like magic. Or hidden under a cushion or a cloth. It's hidden with Bear watching, and he's asked "Where's the ....?" he then finds it and we all clap. Anything at all really. I build it up, Bear knocks it down. Grandad builds it up, Bear knocks it down. Bricks, cushions, toys, anything at all. Eventually Bear will learn to build it up and I will knock it down! Putting anything into a container and taking it out. There are so many different toys you can buy, shape sorters, ones for bricks and blocks and balls. Bear does have these but we like to just put things into other things and take them out again, balls into a plastic bowl, bricks into Nanny's slippers, balls from the ball pit onto the floor, then from the floor into the ball pit. A brick into a box and shake it to make a noise, then take it out and shake it when empty. Bear loves crawling between our legs and the sofa. 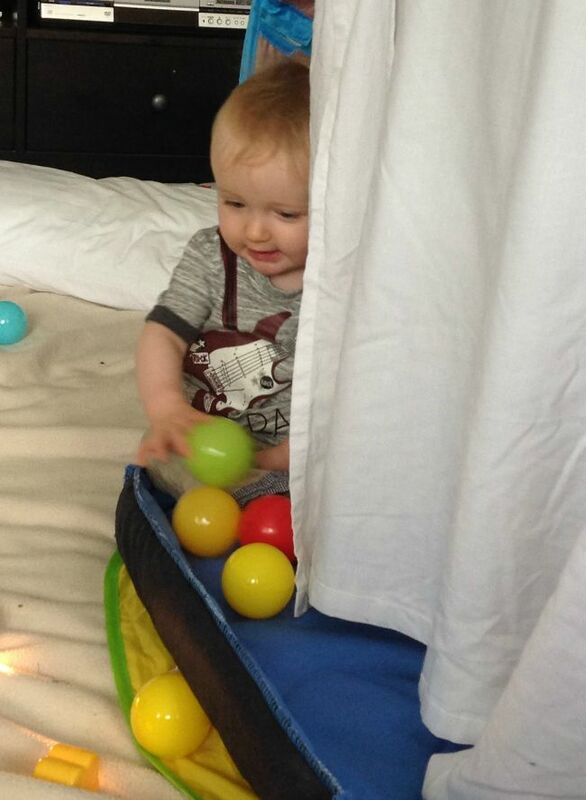 He loves his tent with a sheet draped over to make a den and he loves tunnels made from cushions and sheets. He loves to crawl under the dining room table and chairs. Not the throwing baby in the air and catching them game, all babies love this but is best left to Mummy and Daddy who have loads more energy than me. 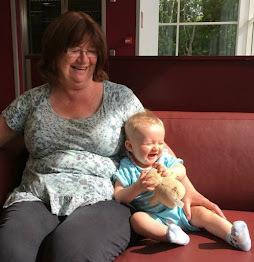 No this is the one where they sit on something bouncy like the sofa and the sofa cushion is pushed up and down so they bounce, this immediately causes giggles and must be repeated again and again. I wonder if a small trampoline would be easier? A book, a piece of paper, anything at all. Pictures are nice, Bear likes The Very Hungry Caterpillar because he likes to put his fingers into the holes. He also likes soft cloth books that make crinkling noises when squeezed. But I read him anything, he will sit still for a while and touch the pictures. If its not a children's book I just talk about the pictures. I say "Time for bed" and Bear runs up the stairs and jumps into his cot and is fast asleep in minutes......... Oh well, I can wish can't I? All the photos are fuzzy action shots! He doesn't stay still for a minute. 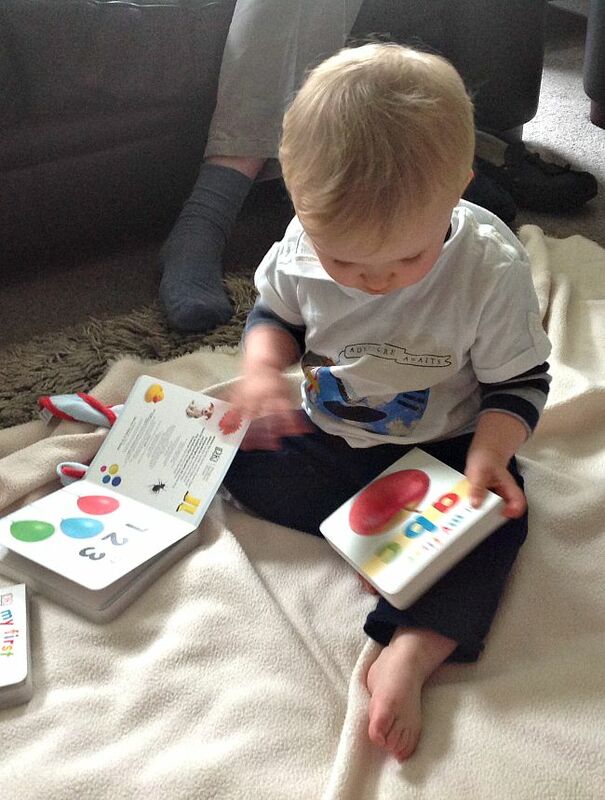 What games do you like to play with your little one?